The plight of enclave dwellers and the status of erstwhile enclaves in India is something that rarely catches the attention of the media and is therefore an issue that few know or understand. Succeeding to Partition in 1947, a number of enclaves were created within the territory of India and Bangladesh, due to cartographical and other errors. Enclaves are parcels of land that are part of the territory of another country – in the context of this statement, Bangladesh – despite their geographic location being within Indian territory, primarily in Assam, Tripura, and West Bengal. These enclaves have been the subject of diplomatic disputes between India and Bangladesh since the creation of the latter and the dispute was between India and Pakistan before Bangladesh independence, and it was only in 2015, when the Land Boundary Agreement came into effect, that the governments of both nations attempted to resolve the matter by transferring territorial sovereignty of the enclave to the nation in whose geographical boundary it existed. 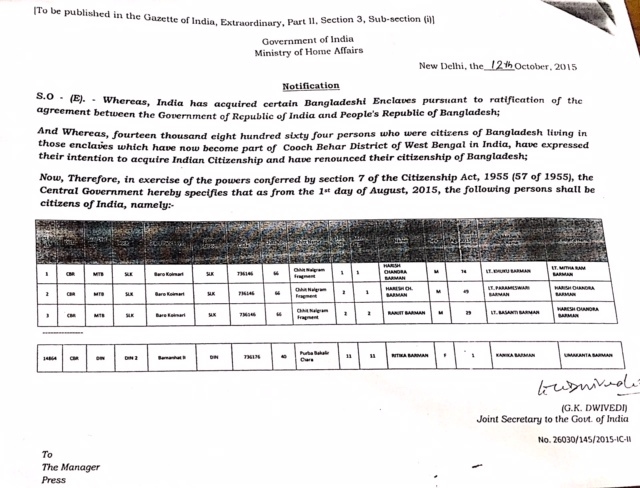 Therefore, a number of Bangladeshi enclaves in Indian territory now officially became part of India (vice versa, Indian enclaves are now became part of Bangladesh), and the residents of the enclaves were given a choice of citizenship in either India or Bangladesh. In the meantime, the residents of these enclaves have suffered greatly due to their peculiar status; the Standing Committee on External Affairs in their report to the Lok Sabha noted that they have long complained of lack of access to basic amenities and facilities, which had long been attributed to the complexities of administration in the enclaves. 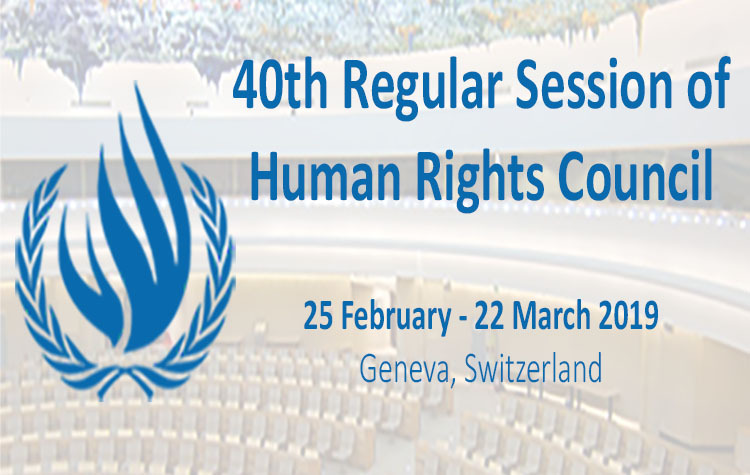 Despite their location, they were subject to the laws of the country to which the enclave officially belonged, but were rendered as de facto stateless persons due to their inability to access rights and remedies. However, the same report suggested that, by passing the requisite 119th Constitutional Amendment – mandated by the Supreme Court in the opinion of In Re: Berubari [AIR 1960 SC 845] – and by transferring the territory, these administrative issues too would recede, permitting residents to access rights available to them as Indian citizens. Three years after the ratification of the Land Boundary Agreement, it appears that not much has changed for the residents of these erstwhile enclaves. The India-Bangladesh Land Boundary Agreement—has implications not only for foreign relations but also for larger questions of human rights and the right to livelihood of more than 100000 human being; estimated by independent researches. A land swap agreement would also give citizenship rights to close to 52,000 people: 37,000 on the Bangladesh side and close to 15,000 on the Indian side (governmental estimation). Banglar Manabadhikar Suraksha Mancha (MASUM) observed the situation at the enclaves was euphoric after the passing of 119 Constitutional Amendment Bill in Rajya Sabha and after the signing of protocol between the Bangladeshi and Indian prime ministers at Dhaka- Bangladesh, the ecstasy reached its epitome. Majority of the populace found this action as a ray of hope and civil society from both the countries found a respite regarding this long pending issue of bilateral concern. But as MASUM already voiced its concerns that this act in haste by the governments and their attitude to exclude the populace from decision making would open up a Pandora’s Box of distress and conflict; became a reality. Banglar Manabadhikar Suraksha Mancha (MASUM) is working in its small resource for the erstwhile enclave dwellers from 2013. From the process of regularization of LBA, both the Governments of India and Bangladesh just fixed the entitlement of the land but except some verbal assurance, Government of India and West Bengal just overlooked the 14864 Bangladeshi erstwhile enclave dwellers. This is mentioned in Government Database that population of 51 erstwhile Bangladeshi enclaves is 14864 and 37334 erstwhile enclave dwellers are belonging in 111 erstwhile Indian enclaves. MASUM received a number of complaints from the erstwhile enclave dwellers from both the countries that they were not included in the joint headcounts in 2011 and 2015. Besides that, MASUM also experiencing the overall apathetic attitude of governmental departments and agencies and how the erstwhile enclave dwellers are being systematically neglected and their legitimate rights have been denounced. Citizenship– According to The Citizenship Act, 1955 in section 7 it is specifically explained that “Citizenship by incorporation of territory.―If any territory becomes a part of India, the Central Government may, by order notified in the Official Gazette, specify the persons who shall be citizens of India by reason of their connection with that territory; and those persons shall be citizens of India as from the date to be specified in the order.” But in reality the mentioned process was not properly followed to include erstwhile enclave dwellers in the citizenry list. Only a letter from Ministry of Home Affairs sent to the District Magistrate of Cooch Behar with a list of names of erstwhile enclave dwellers (List is attached below). This incomplete list is the only document available from governmental agency over the issue and their initiation over this important and major issue. The erstwhile enclave dwellers were given voter identity card with serious flaws and incomplete or incorrect information but that too not fulfilling the purpose. Few months back MASUM did one fact finding where one erstwhile enclave dweller was arrested in Delhi with a doubt that he is a Bangladeshi intruder. He produced his voter identity card before the police but the police personnel opined that the EPIC is forged. He was deported to Bangladesh. This incident proves that the identities or facilities through EPIC or AADHAR distributed to erstwhile enclave dwellers are with serious defects and their names have not been included to the citizenry list of the country. Land – After execution of Land Boundary Agreement the total land has been swapped; the erstwhile enclave land with private ownership of erstwhile enclave dwellers from Bangladesh has been included to the Indian territory and government assured the dwellers that the land will be handed over to them by land registration after land survey and checking of land documents. Three years passed after this announcement, but the land survey has not been completed yet and lands are still with the government not with its actual owner. Erstwhile enclave dwellers cannot mortgage or sell his/her land in any emergency. After one and half year from execution of Land Boundary Agreement, constructional work of roadways has been started at erstwhile enclaves and Public Works Department acquired lands for this purpose but the erstwhile enclave dwellers were not compensated for loss of their land. MASUM made complaints before National Human Rights Commission and other administrative departments on behalf of land losers but till date the matter is remained unsolved. On the other hand 945 erstwhile Indian enclave dwellers came to India after LBA execution. These people were promised by the Indian Government to get proper rehabilitation and compensation. After 3 years of LBA execution, these people are still kept in 3 rehabilitation camps situated at Dinhata, Mekhliganj and Haldibari in Cooch Behar district with any adequate rehabilitation and compensation package. Other Social Security Schemes –3 years passed from the execution of Land Boundary Agreement but till date most of the erstwhile enclave dwellers are out from social security schemes earmarked by Government of India. In many of the erstwhile enclaves; Public Health and Engineering Department (PHED) dug deep tube wells for drinking water and installed solar pump to meet the water requirements for agricultural purpose. But after few months the deep tube wells were not functioning. They repeatedly complained to PHED and District Magistrate. But till date the problem was not resolved. Almost same story is for solar pump too. At the time of installation it was propagated that 30-40 Bigha of land will be irrigated but only catering 5-6 Bigha of land. Only 7 erstwhile enclaves out of 51 got the electricity connection and in other erstwhile enclaves electric poles have been dug without wiring. The institutional deliverances from State has not been initiated yet, no new schools, ICDS centers, health delivery units and police station has been came in to existence to cater the erstwhile enclave dwellers, moreover few ICDS centers in the vicinity of erstwhile enclaves have been shut down. There are many erstwhile Bangladeshi enclaves where the work for roadways has not started yet or it has been stopped in half way. Number of times dwellers submitted written complaint but without any positive response from administration. New polling station may be proposed if a village has more than 300 electors and a suitable Government building is available for the polling station. If a new colony with a number of dwelling units has cropped up, then new polling station may be created. But the erstwhile enclave dwellers asked to cast their vote in the polling station at their adjacent villages. Most of the erstwhile enclaves consists more than 300 voters but no new polling booth has been proposed for erstwhile enclave dwellers. In November 2015 total 945 erstwhile enclave dwellers came from Bangladesh. Government of India took their all responsibilities. First they were located in 3 rehabilitation camps situated in Dinhata, Mekhliganj and Haldibari. Every family received one tiny corrugated roof room with a small piece of area as kitchen. Each family is getting 30 kg of rice, 5 liters of mustard oil, 5 liters of kerosene oil, 1 kg of salt, 1 kg of powder milk and 1 kg of lentil as monthly ration. This arbitrary rationing and space provided is inhumane as a family with 7-10 persons has to accommodate in the space provided and quantity of ration. There is no scope for earning and government has not created any job opportunity for them and as a result, after few months, a sizable numbers of erstwhile enclave dwellers from camps migrated to other places in search of job. Till date government has not announce a clear cut compensation and rehabilitation package for them. Few months back government started constructing flats/ apartments for the dwellers having knowledge that they belong to rural background and not comfortable with urban settings and the dwellers showed their non-acceptance. For Mekhliganj camp dwellers, flats are constructed at a remote place and at the bank of an eroding river. The main road is minimum 10 kilometers away from the site. This is the situation of the affected people after 3 years from execution of well trumpeted Land Boundary Agreement between India and Bangladesh. The euphoria and hullaballoo subsided, the promises by the governments is fading its impacts on the memories of subjugated erstwhile enclave dwellers for whom appropriate adjective was used as persona non grata; but question is whether they came out of this bracket of identity or they still person of nowhere? The government of India has obligation to answer this question.